To ensure the highest safety standards for your employees or colleagues, there are many things to consider when selecting and using lifting magnets in accordance to Below-the-Hook compliances. Before you place an order for lifting magnets, you need to fully understand your operation, loads characteristics and how they can affect the lifting operation. It is crucial to follow these ASME B30.20 guidelines about the materials being lifted to assure a safe operating environment. Weight: Estimate the total weight of load = Length (in) x Width (in) x Thickness (in) x 0.29 lb/in3. 0.29 lb/in3 used here is only an estimate for steel and best to be replaced if a more accurate density value is known. Composition: In general alloys are not as magnetic as low-carbon steel and reduces the ability of magnetic lines of force to flow through the load. Low-carbon or mild steel, with the amount of carbon typically being between 0.05 and 0.29% by weight (i.e. AISI 1018 steel), is close to pure iron and ferrite making it magnetic. For such material, the rated lifting capacity stated would be 100%. In comparison, the lifter has 85% of rated lifting capacity when lifting medium-carbon steel (approximately 0.30-0.59% carbon content, i.e. AISI 1045 steel), 70% when lifting high-carbon steel (approximately 0.60-0.99% carbon content, i.e. AISI 1095 steel), and only 50% when lifting very high- carbon (~1.25%-2.0% carbon content, i.e. cast iron). As for stainless steel such as the 300 series with less than 0.1% carbon, however, the alloy composition is as high as 18% chromium and 10% nickel making such material almost as poor a magnetic conductor as glass or dry wood. 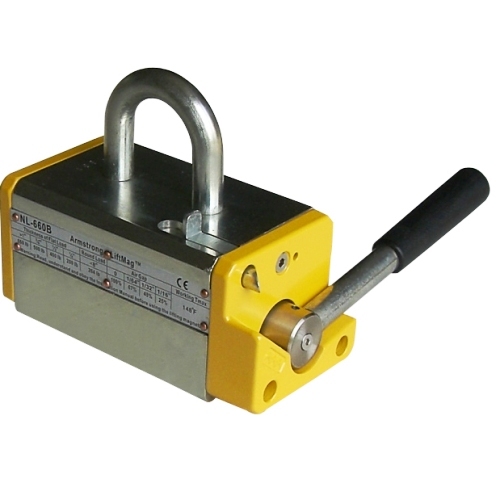 Surface condition: For maximum rated lifting capacity, the load surface must be flat, clean and the full bottom of magnetic lifter is contacted. Magnetic force is extremely sensitive to air gap as air is a magnetic insulator and magnetic force lines do not travel through it. In cases of lifting ferrite loads, any dirt, paint, surface unevenness, rust or oil would result in air gap or are as effective of an insulator as air which yield weaker lifting capacity. Only 50% of rated lifting capacity can be achieved with air gap as little as 0.80 mm (assuming all other conditions are at the optimum circumstances). Click here to learn more about impact of air gap on lifting capacity. Thickness of flat load: The thicker the load, the more lines of magnetic force are able to pass through; vice versa, the thinner the load, the fewer lines of magnetic force flow through the metal resulting reduced lifting capacity. For each permanent lifting magnets, you would find two different values for load’s minimum thickness. 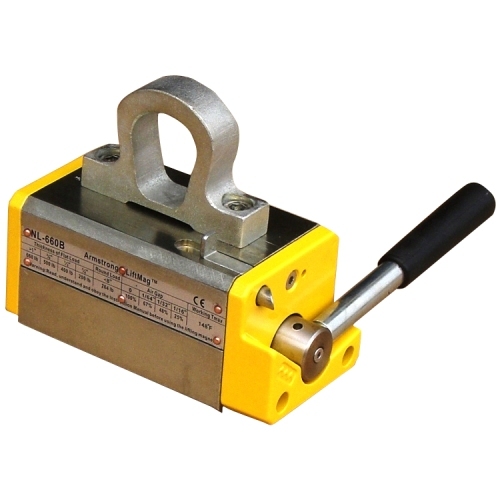 One value is the minimum thickness to reach rated lifting capacity stated and the other is minimum thickness required for the lifting magnets to work or in many cases, to be able to rotate their handles. If it is difficult to rotate their handles, your loads are very likely too thin for this specific model and you should never apply any strong abrupt force which can cause permanent damage to the device and/or personal injury. Ambient or contacting temperature: The maximum allowable temperature depends on the lifting magnet material and its components. At elevated temperature, lifting power would be de-rated; ~90% of rated lifting capacity above room temperature of 90oF, ~75% at 148oF and the magnet would be permanently damaged at temperature above 176oF. In addition to ASME B30.20, we also have a list of recommended values for the length of flat load versus their thickness. Thin metal plates can often bend when they are lifted up, or even peel off of the lifting magnets if they are too long. Every working situation is different and it is important to evaluate the load surface to estimate the degree of deduction in rated lifting magnet. Click here to better estimate the de-rated lifting capacity or refer to ASME B30.20. If you’re unsure of your model selection, fill out our lifting application form to provide us as much and accurate information as possible and our technical team would then make recommendations.